Hey, maybe Larry Bird, Kevin McHale and Robert Parish did come through the door. 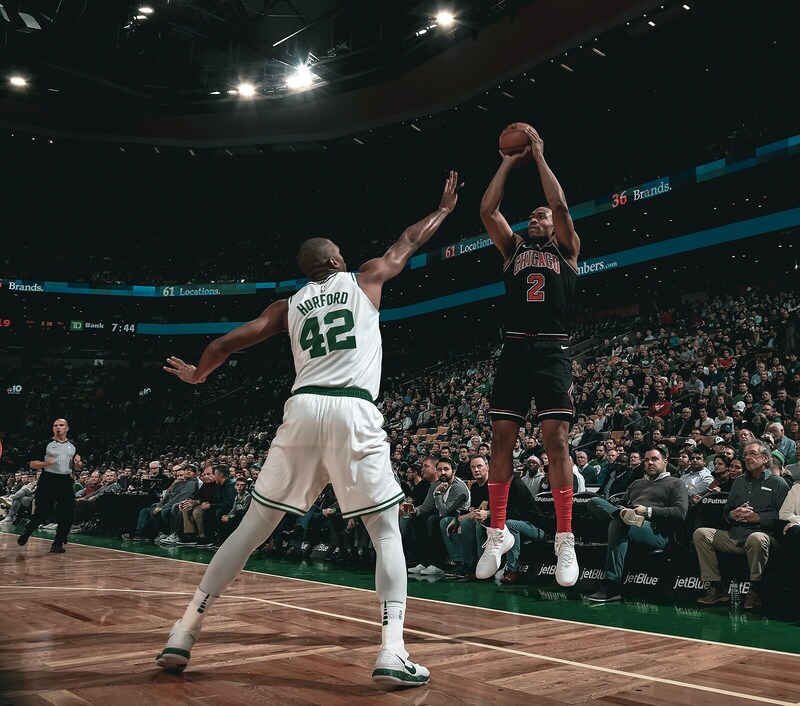 Not that they were needed, anyway, as Kyrie Irving, Jalen Brown and Jayson Tatum Wednesday did a pretty good job of slamming the door in the Bulls faces in a dominating 111-82 Celtics victory. The Bulls actually led 24-19 after a good first quarter as Jabari Parker scored all of his 14 points. But yet another second quarter disaster in which the Bulls were outscored 32-11 pretty much turned the second half into a long distance shooting contest after the Celtics shot to a 71-47 lead with 4:33 left in the third. Shaquille Harrison with 10 of his 16 points in the fourth quarter led the Bulls. Parker had his 14 and was scoreless after the first quarter, shooting zero for four. 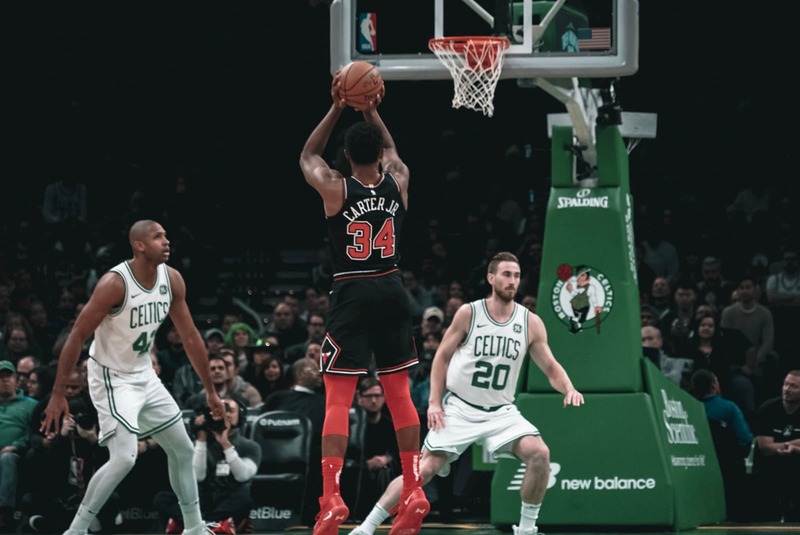 Wendell Carter Jr. had 11 points and Zach LaVine had 10, the latter ending his streak of scoring at least 20 points at 15 games with one from last season to tie for second longest in franchise history. 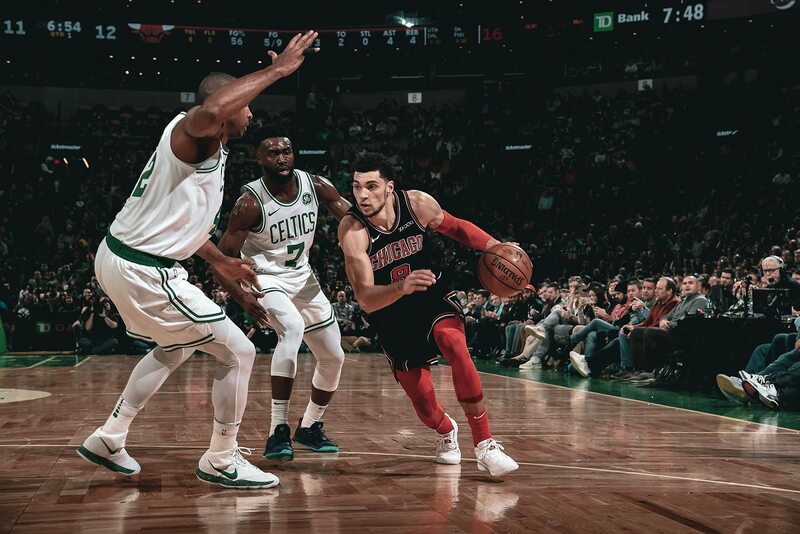 But LaVine might have been the best player on the floor overall for the Bulls with team highs of nine rebounds and four free throws and tied for the team lead in assists with four. The Bulls in another game that lacked alacrity had just 16 assists. They’re also averaging just 96.8 points the last six games with five of the last six scoring fewer than 100 points. That might have sounded boastful or egotistical if it weren’t so accurate. Which opponents have figured out. 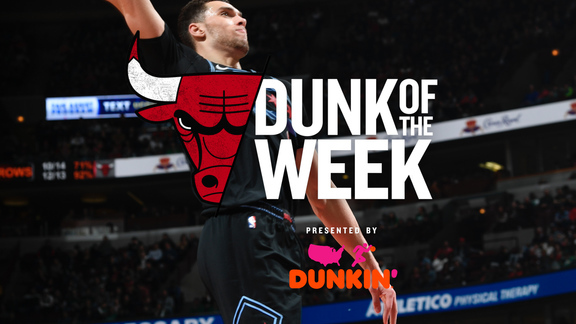 LaVine probably was worn out some from his terrific effort trying to rally the Bulls Monday in their loss to Dallas. He played 41 minutes in that game with 11 free throw attempts and 23 shots, five rebounds and five assists, the latter second on the team. Basically challenging others to make enough shots, opponents have double teamed LaVine off pick and roll with a third defender hedging toward him. Even in isolation, teams have sent at least two at LaVine, who coming into the game was basically averaging twice as many points as second leading scorer Parker. Perhaps indicative of LaVine’s fatigue was a breakaway after a turnover to open the third quarter in which he passed on any sort of exceptional dunk and just dropped the ball in. It did get the Bulls within 14. Then Boston scored 11 in a row. Still it’s a lot to ask, especially against a Boston team that came in leading the NBA in defensive efficiency. The Celtics also were primed coming off a 1-4 road trip and moved to 8-6. The Bulls are 4-11 and are in Milwaukee Friday and home to Toronto Saturday. 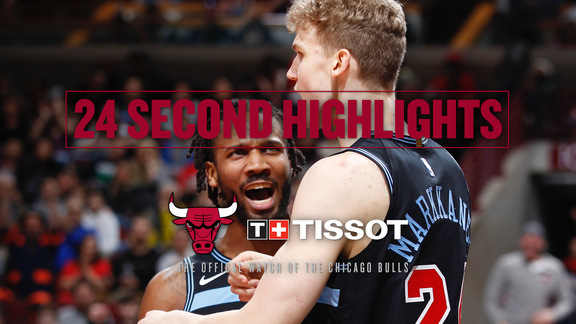 Actually, the Bulls had been improved defensively coming into the game, moving into the league’s top 10 in field goal defense and the top half in three-point shooting defense. It was evident in if not the wins, the tight games until Wednesday. The Bulls had big losses previously to Charlotte and Golden State. Since that Golden State game, the Bulls were 2-5 before Wednesday. All of the five losses were by single digits and by an average of five points per game. "I trust the guys more than anything. I’m going to do what I have to do, draw two or three defenders and kick it out to the corner or slots and try to be aggressive when I can." It’s just when things go bad, they go very, very bad. It’s, of course, a recurring theme of defeat along with the absences. Lauri Markkanen was captured in the background dunking in a pregame NBCSportsChicago segment. Though Hoiberg said he’s still weeks away. Similarly, Kris Dunn and Bobby Portis are weeks away and Denzel Valentine remains out indefinitely. Which makes that second quarter going to the bench not exactly a traditional matchup of reserves. All that prompted rookie Carter to suggest a strong voice or voices is needed among the players. There perhaps may be something to that, though that’s a difficult circumstance for a young team with so many players injured. Typically, Portis and Dunn are the most vocal. They are wearing sport coats trying to heal. The veterans are Robin Lopez and Justin Holiday, but Lopez is in and out of the rotation (back in now) while Holiday doesn’t quite have the authority. LaVine says he’s done his best to help teammates stay positive, which becomes more difficult when the deficit ranges into the 20s. It’s more difficult, of course, to be optimistic when losing like the Bulls did Wednesday. Though for the large majority of the games even more shorthanded than any opponent and favored by bettors in just one game, the Bulls have mostly played with effort and determination. Hoiberg continues to emphasize the pace and ball movement, but it’s proven difficult to break historic personal habits. Remember, just one of the Bulls five starters Wednesday was with the team all last season. And only Lopez off the bench from the rotation. That disconnect was more evident against a veteran team like the Celtics who have been together for several years with expansive playoff experience. The short answer is watching the Celtics dribble looking for a better shot while the Bulls dribble looking for a shot. Bulls passes tend to come more often after a dribbler cannot get a shot and throws the ball out. The Celtics drive more to draw the defender and then pass and move the ball. LaVine does so the most among Bulls players, but teams are effectively betting that no one else will make enough shots amidst the absences to force a strategy change. There always are some encouraging signs in these things with Harrison making three steals and some good defensive plays when the game still was being reasonably contested. Parker was good in the post to open the game, taking advantage of mismatches, but then wandered to the perimeter to hoist shots. Holiday made his first two threes in that encouraging first quarter, though missed his next five. He’s averaging three made threes per game the last 10 games. Ryan Arcidiacono fought his way to eight rebounds, perhaps the best inch for inch rebounder in the game. But the Bulls again shot below 40 percent, the fourth game in the last six they’ve shot below 40 percent. It mostly coincides with the defensive attention to LaVine. He is shooting 37 percent the last six games. The first six games he was shooting 53 percent.